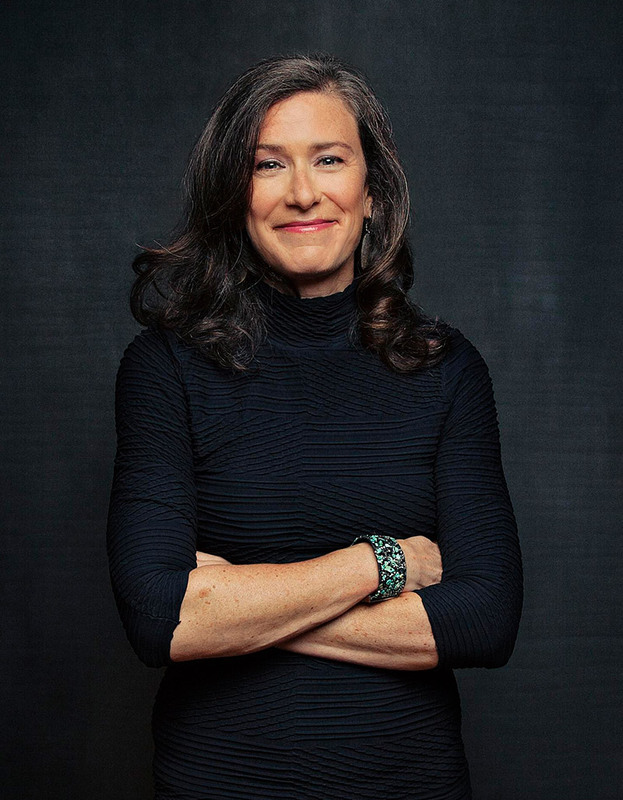 Defender of democracy, activist for women’s rights, and advocate for the LGBTQ+ community, Amy Siskind is best known as the author of The Weekly List and as President of The New Agenda, a non-profit dedicated to the advancement of women. Within a decade of graduating from Cornell, Amy was the first female managing director in the history of the investment bank Wasserstein Perella. She subsequently ran trading floors at Morgan Stanley and Imperial Capital, where she was also a partner. Her mantra: learn, earn, return. 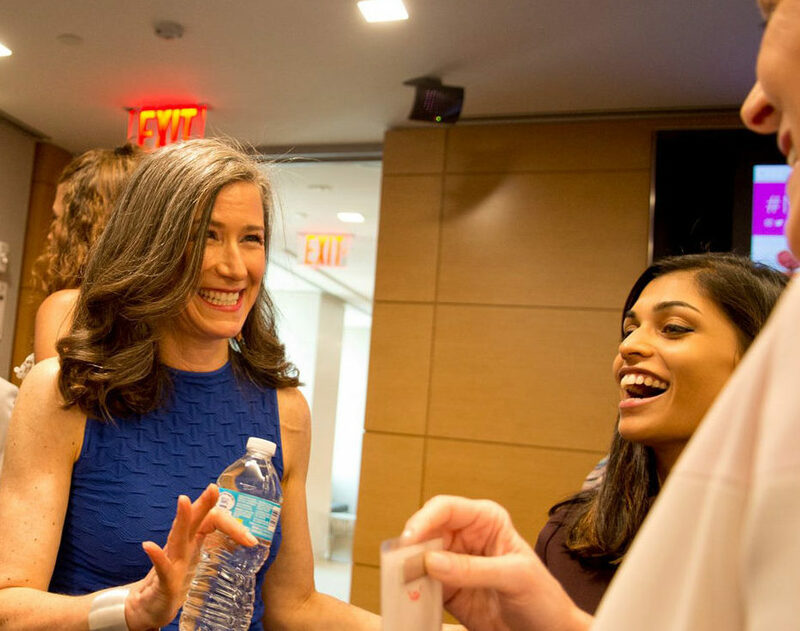 She made a concerted effort throughout her career to recruit, hire, and mentor other women, co-founding Damsels in Distressed — named after the distressed debt market — a network of women supporting and raising each other up. Amy counts among her proudest achievements on Wall Street that many of her mentees have gone on to hold senior positions in the industry. Ready for new challenges and to give back, Amy left Wall Street in 2006. At a luncheon of the Eleanor Roosevelt Legacy Committee, keynote speaker Senator Hillary Clinton inspired Amy to volunteer for her 2006 Senate re-election campaign and her subsequent 2008 Democratic primary bid. In its aftermath, Amy hosted a group of like-minded women in her living room to discuss next steps. Sexism in the media wasn’t going to go away on its own, nor would either of America’s political parties take the initiative to call out misogyny in their own midst. In 2008, Amy launched The New Agenda, a nonpartisan advocacy organization whose mission is to improve “the lives of women and girls by bringing about systemic change in the media, at the workplace, at school and at home.” Though The New Agenda neither endorses nor raises funds for political candidates, it has always asked the question: in terms of their leadership, representation and policies, are the two major political parties representing women’s interests? As The New Agenda’s spokesperson, Amy has appeared frequently on news outlets to discuss structural biases against women, including the double-standard women of both parties face in the media. After the Obama administration initially fell short on nominating women to leadership roles, The New Agenda created “Cabinet Watch” to provide lists of qualified candidates and keep the president accountable. After becoming a regular contributor to The Daily Beast and to Huffington Post, Amy’s piece “Sexism Against Conservative Women is Still Sexism” sparked a long overdue conversation about the treatment of women in both political parties. The New Agenda is ultimately about inclusion, fostering connections, building community, and ensuring that more women in future generations can share the kind of multi-faceted success that Amy has known. The New Agenda’s Young Women Leadership Council has connected hundreds of college and young professional women with mentors well versed in the challenges of work-life balance in various career fields. Amy has mentored scores of young women, many of whom have come in and out of her life over years or decades as they face new challenges. The New Agenda’s annual National Girlfriends Networking Day event has featured Soledad O’Brien, Hannah Storm, Gretchen Carlson, Christine Romans, and Rose Marcario among its panelists – and was the first women’s organization to include a transgender woman panelist, Alexandra Billings. Trump’s incoherent message. His polling numbers. His lack of any political track record or demonstrable skills other than ostentatious self-aggrandizement, rabble rousing, and defrauding investors. These made a 2016 electoral victory for Trump utterly improbable. Then it happened. Many of the rest of us went back to our ordinary lives. But Amy knew too much. Emboldened by hearing the painful tales about the uprise of Hitler in her youth, and having committed herself to making American public life more equitable, she knew that paying attention mattered more now than ever. Was America descending into authoritarianism? It couldn’t be true. Could it? If it were, there would be evidence. After all, the unthinkable had already happened. Amy started keeping a list. What had changed this week? In what ways was the Trump administration advancing authoritarian norms, hateful rhetoric, and retrogressive policies? When she began, Amy had no grand plan. For her own sanity, she simply wanted a way to chart the course back to normalcy once Trump was out of power. She posted the early lists on Medium and on her social media accounts, largely followed by family, friends, advocates of The New Agenda, and fellow Hillary Clinton supporters. Week 1 had 9 items, and Week 2 had 18. By Week 3, which had 26 items, people told Amy they had missed stories, and asked that she add in source links.. Week 9 – the week of Meryl Streep’s historic Golden Globes speech – was the first week the list went viral, with over 2 million views. Amy suddenly found herself launched to prominence as one of the spokespeople for the Resistance. As a service to the voting public and as a chronicle for future generations, Amy meticulously noted events threatening the health of the American republic and its democratic norms. She standardized the format, editing entries carefully, and providing clear sources for her information. Today, between 500,000 to 1 million followers read The List each week across a variety of platforms. After the first year, Amy crowd-sourced grassroots funding for The Weekly List website, which includes videos, a search function, and other resources, along with names of each donor, all donating $25 or less. She had previously declined offers to publish The List in book form, thinking herself too busy, but when Trump’s F.C.C. Chair pushed for the repeal of net neutrality, Amy heeded the warning of experts in authoritarianism about disappearing information. In March 2018, Bloomsbury released The List: A Week-by-Week Reckoning of Trump’s First Year. The book’s publication has expanded the opportunities for Amy to collaborate with those who would similarly put a check on the Trump regime’s abuse of its authority. Her first speaking engagement on her book tour was in Chicago, at the American Civil Liberties Union’s annual event. She was both the first female keynote speaker in the chapter’s history, and the first to donate their speaking fee back to support the organization’s important work. Amy also raised funds at big events on her book tour to donate to organizations doing the work alongside the Resistance, including the Southern Poverty Law Center, the Anti-Defamation League, and the N.A.A.C.P. Legal Defense Fund. With midterms approaching, Amy recognized the vital need to put a check on Trump’s unbridled power, so she morphed her book events into opportunities to raise funds and rally support for 2018 candidates across the country. “We’re talking about saving our democracy versus becoming an authoritarian state,” Amy explains. She chronicles fallen norms as a nonpartisan exercise, writing the first draft of history of a country in danger of descending into authoritarianism. The violations of our norms that she has catalogued are not those of either political party but of the fundamental structure of the American way of life. Country first – both Democrats and Republicans should be equally committed to democracy. 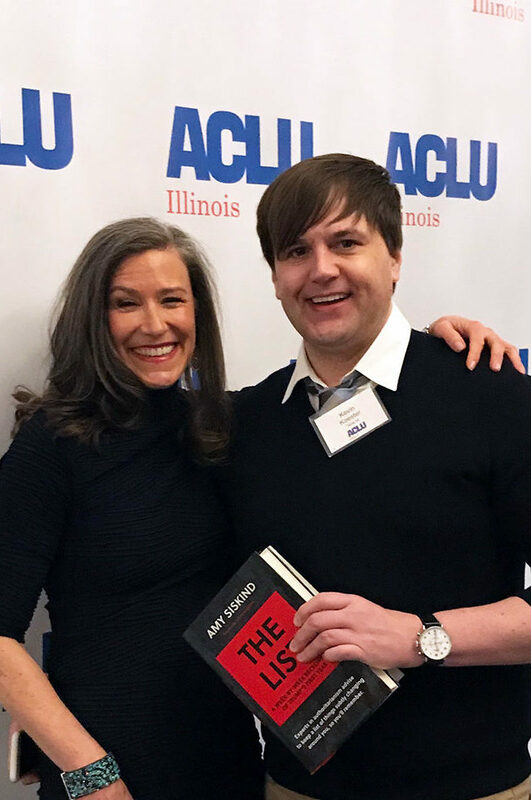 As Trump’s time in office extended, and Amy became concerned that the media were missing many stories and an exhausted country was having a hard time keeping up, Amy created a podcast to put violations of America’s democratic norms in context. She has followed the cast of characters and their interwoven subplots since the beginning, with verifiable evidence to back up her assessment. This allows Amy to help listeners connect the dots. In 2017, Politico named her one of the Politico 50, an annual ranking of the idea leaders in American politics. Forbes featured hers as one of the “podcasts created by women you need to be listening to right now.” The project was featured in The Washington Post. Shortly after, the Library of Congress announced that it would archive The List, along with the podcast, for posterity. Within days of announcement, Russian state news outlets subjected Amy to slander. One Russian blog labeled her a “radicalised lesbian.” This coincided with an uptick in her sites being subjected to hacking attempts. Amy is the proud mother of two human children and of two dog children, both named for her former Wall Street colleagues. The legislators of Westchester County, New York, where she resides, recently honored her for her LGBTQ+ advocacy. Amy serves on the prestigious President’s Council of Cornell Women and on the Cornell University Council.